Return to Exile, the first book of The Hunter Chronicles by E.J. Patten, tells the remarkable story of Sky Weathers and the secrets surrounding his birth that continue to haunt his nearly 12-year-old life. Constantly moving, his family never staying long enough to become part of a community, Sky is an experienced outsider with no close friends except his odd Uncle Phineas. 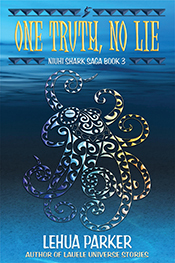 Under his tutelage, Sky has learned all about puzzles, traps, and hunting—hunting monsters, that is. As the story opens, Sky has almost convinced himself that all of his Uncle’s fantastical stories are really just an extreme form of pretend, imagination gone wild, and nothing more. After 11 years of wandering, the Weathers family returns to their hometown of Exile with the expectation of finally settling down. When Uncle Phineas misses a scheduled rendezvous, everyone gets little edgy. Worried about Phineas and unable to resist exploring ancestral homelands, Sky embarks on a series of adventures that leads him to discovering who he is, his mysterious past, and the high stakes reason behind all of Phineas’ deadly serious games. Patten has a lot of story and backstory to tell in this book, a horde of characters to introduce, and oodles of detail about monsters and the mayhem they cause. In his world, magic and monsters are not a matter of hocus-pocus, but rather science that’s not fully understood. For readers who love the minutiae and fine print of an imaginary world, there’s a lot here to chew on. Much of the plot hinges on the workings of monsters and hunters and how all the pieces fit—or seem to fit—together. It’s obvious that Patten loves puzzles and games in all their forms including word play. He delights in turning phrases on their heads. His characters are witty, and the narrative is polished, perhaps a tad too highly. Occasionally the banter and action feel contrived, taking the reader out of the storyline and action simply to be clever. However, it’s likely that only adults with too much literary critique baggage will feel this way; young readers will likely be swept up in the richness of Sky’s journey and will enjoy the winks and laughs along the way. 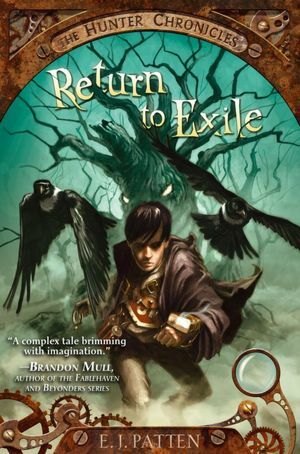 Return to Exile is appropriate for those eight and older who can read near a 5th grade level or higher. While it’s easy to see how this action-packed fantasy appeals to boys, girls will also enjoy getting to know Sky and his monster hunter friends. 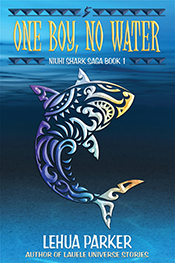 Readers who liked The Hobbit, the Percy Jackson books, and Fablehaven series will find similarities here. 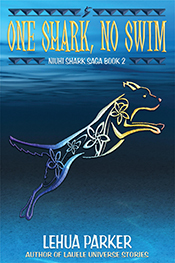 The pacing and humor is certain to keep even reluctant young readers engaged and looking forward to the second book in the series. Return to Exile, Snare 1 of The Hunter Chronicles is published by Simon & Schuster Books for Young Readers, authored by E.J. Patten, and beautifully illustrated by John Rocco. It can be ordered or purchased as an eBook or in hardback from Amazon and Barnes & Noble, as well as wherever fine books are sold.